Ceres, the Roman equivalent of the Greek goddess Demeter, is the godess of agriculture and motherly love. 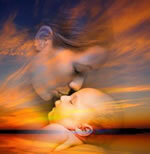 She happily wandered the earth with her beautiful daughter Persephone, bestowing a perpetual harvest upon it. One day, alone in a field of flowers, Persephone was stolen away by Hades to the dark and gloomy palace of the Underworld, forced to become his wife. Angry at the abduction of her daughter, Ceres withdrew her bountiful harvest from the world, causing the plants to wither and die. The land became baren and bleak. The people were starving. Alarmed, Zeus intervened and ordered Hades to return Persephone to her loving mother. Persephone was so brokenhearted after the abduction that she refused to eat. But as Persephone was leaving his palace, Hades slyly offered her a pomegranate, the food of the dead, knowing that if she tasted it, she would have to return to him. In her joy at being reunited with her mother, Persephone absentmindedly ate a few of its seeds. In doing so, she was indeed compelled to return. Eventually, a deal was struck between Ceres and Hades that required Persephone to spend only three months each year in his palace in the Underworld. During this time, Ceres grieves for her daughter and again withdraws her gifts from the world, resulting in Winter. Thus, Ceres is also associated with the seasons of the year. Symbolizing the function of earth mother, the placement of Ceres in the birth chart shows the condition of your need to be loved and cared for and the impact on your sense of self-worth if those needs are not met. That in turn affects your ability to care for and nurture others. Ceres also describes your self-reliance and willingness to do the hard work that is required to produce the grains of the earth...the nourishment needed to sustain life. And finally, there are lessons of attachment and loss that deepen the capacity for grief and sorrow. The challenging aspects can show fear of abandonment, an unwillingness to accept the personal changes necessary for self-development, and deep, unresolved sorrow. On the other hand, the flowing aspects indicate that healing of sorrowful losses has taken place. The resulting growth of personal strength and responsibility enhances the capacity to understand these fears and sorrows in others and the ability to give them the support they need. 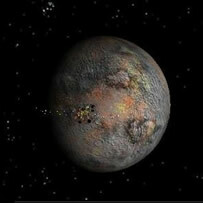 Ceres was the first asteroid to be discovered. It was discovered on January 1, 1801 by Giuseppe Piazzi, a mathematician who was appointed in early 1787 as the chair of Astronomy in the newly founded University of Palermo. His enthusiasm and drive led to the founding of the Palermo Astronomical Observatory. Ceres is the largest asteroid and is the only one classified as a dwarf planet, one of the space object types categorized as minor planets. It takes 4.60 years for Ceres to complete it's elliptical orbit around the Sun. It spends about six weeks in Pisces and Scorpio and close to three months in the other signs. Ceres turns retrograde every 14-17 months. The retrograde period lasts approximately three months.